This week our teams started coding their their projects for the Pioneers challenge. The Zombie Trolls and the Zombie Herders started by playing audio for their Raspberry Pi projects using Pygame. The green fingers spent the session trying out sensors for their Arduino based project like this DHT11 temperature and humidity sensor. They also got a soil moisture sensor and a float switch working. We also got some great news from Twitter before the session. Here is a picture of the mystery box. 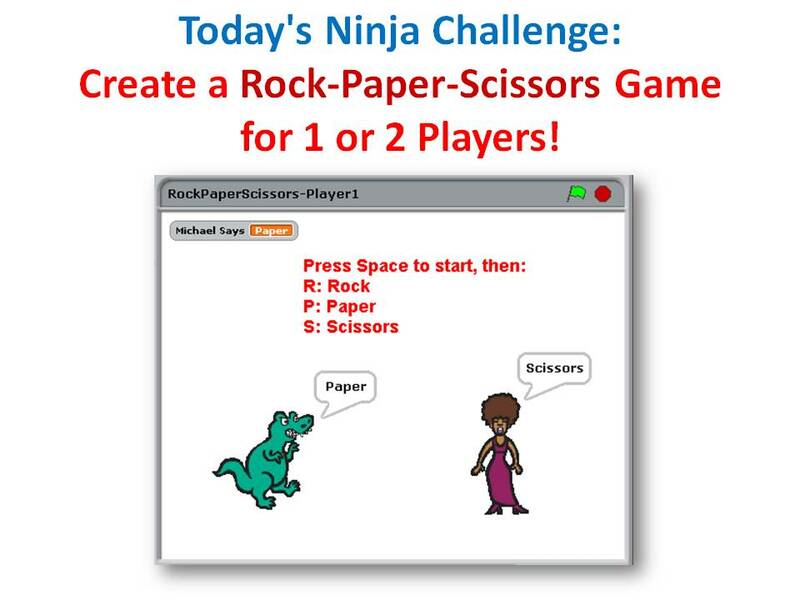 Intermediate Scratch – Challenge 15 – Create a Rock-Paper-Scissors Game for 1 or 2 Players! This week’s challenge is to create a game of Rock-Paper-Scissors. This week, you can choose to either create a 2-player networked game with a friend, or if you don’t feel like doing networking, you can write a 1-player version where you play against the computer. It’s up to you! This challenge makes use of the networking ideas that we have covered in recent weeks, when writing a network Chat program and when writing 2-player Pong. Next time, we will help ninjas to work on their own games.